October 13 -Ebola chatter in the Corporate Media pushed stories about war and World War 3 off the front pages for the second week in a row. The Ebola virus in America and the stoking of nationwide Ebola fear once again sucked most of the media oxygen from discussions of ISIS, war in the Middle East and World War III. Does this mean things have quieted down? It only means the Corporate Media has other fish to fry–and most of those fish have “Ebola” written all over them. The number of “World War 3”-related articles this week and last hit a two-week low going back at least until the beginning of summer. The killing continues in Ukraine, Iraq and Syria. Violence is a normal every day happening in countries such as Yemen and Libya. But the media is intent on ensuring that “EBOLA!” is the fear du jour. EBOLA! temporarily has driven World War 3 from the top of the news for the second week in a row. But, one suspects, not for long. Will Ebola trump World War once more this coming week? Or, will attention shift back to events in the Middle East or eastern Europe, the two areas currently soaked in violence? Or, will a NEW trouble spot claim the Corporate Media spotlight? The Bible warns of world war before Jesus returns. After the fall of the Soviet Union, this scenario was laughed at in some quarters. In the 1990s, president Bill Clinton even declared a “peace dividend” and funneled money from defense to other items on his domestic wish list. Still, the US military got funded in the 1990s–and quite handsomely too. The Bible clearly declares World War is coming. The normal buzz about Islamic terrorists coming across the unprotected southern border continued. But there was a new twist: Homeland Security floated the idea that “spy blimps” might monitor the border–and, one suspects, other events as well. While chances for a domestic terror attack are up (due to increased media activity warning of an impending terror attack) in the near future, it is suspected that the IMMEDIATE chances of a domestic terror attack are in a holding pattern awaiting one more level of escalation in the pre-war propaganda campaign that has been taking place in the US Corporate Media over the two months. THE FOLLOWING WILL HOLD TRUE UNTIL THE BEGINNING OF WW3. Ebola is back at the top of the news. THE CALL: Regardless of the fear promoted in the media, World War 3 is still down the road. But rest assured, it is coming. Only the exact timing is unknown. This is not a rhetorical question; not for the times in which we live. THE BAD NEWS: Fear continues to be the product best peddled by the Corporate Media: fear of Ebola, fear of war, fear of whatever. The propaganda campaign, which is necessary to prepare a country for total war, continued to escalate over the last week–as it has for the last two months. THE GOOD NEWS: Asia has continued to be quiet. It is about time for a flare-up in one of the traditional Asian hot spots (North and South Korea, Japan, China). Earlier, we felt a flare-up might occur sometime in September. This did not happen–unless the reader counts the uncertainty surrounding the whereabouts of North Korean leader, Kim Jong Un. Is World War III on? Once more this week: the fear of Ebola in America trumped World War. 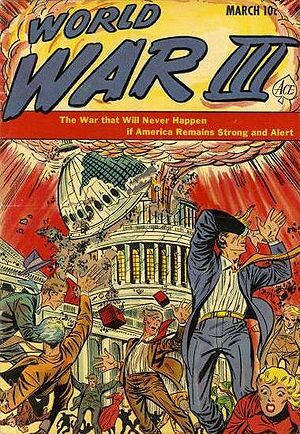 It’s suspected that talk of world war will rise back to the top of the media rotation this week or next. It’s hard to stoke fear in the Corporate Media for more than a couple weeks in a row. Ukraine – Violence in Ukraine has settled into a grinding guerilla-type warfare. Accusations from both sides continue, as do Russian threats to gobble up more of this former Soviet Socialist Republic. Baltic States (Lithuania, Estonia, Latvia) – Russia is growling at the Baltic States. No major threats over the last week. All the three small countries can do is hope the West honors its commitments. All three were former Soviet Socialist Republics. LIBYA: Chaos and violence in Libya continues. From the way the propaganda is shaking out, our guess is that LIBYA will eventually become a part of a sprawling Islamic State. IRAQ: The bombs are dropping once more in Iraq. The media meme now is “Bombs are not enough!” ISIS continues its seemingly-unstoppable march through Iraq and surrounding countries. Turkey: Turkey is involving itself along the fringes with a number of actors in the Middle East. At some point in the future, it’s expected that Turkey will get involved in some manner in the Islamic State. Rumblings of Turkey and the Kurds getting involved in violence appears to be a distinct possibility. GAZA: Israel and Hamas continue to kill each other’s civilians. The killing grinds on–while the media is conveniently focused elsewhere. Even the combatants seem preoccupied. SYRIA: Syria is a free-for-all. Bombs from the West, mercs from all over and the USA sponsoring all types of destabilizing events within the country. Syria continues to be a mess. There’s a 40% chance of World War III; which is down 1%. This is not because of any peace efforts. There is just a feeling that World War 3 has a little bit longer to go before kicking off. The long term view is 100%. This is no change from last week. The number is due to the continued strong prewar propaganda push targeting the USA and continued maneuvering in the Middle East. Pre-war propaganda in the USA continues at a moderately-high level. Asia continues “Quiet.” This, of course, can change at any time. Chinese media continues speaking of being prepared for WW3. Africa – quiet; North Africa and Horn of Africa remains turbulent, but quiet. Most of the regional assessment–as has been the case for the last month–registered “no change” this week. North Korea – up slightly on news of possible coup and instability. North Africa – Libya remains steady because of continued violence. Libya may or may not end up as part of a ISIS confederation/caliphate. USA – Remains moderately high. Government interest in Ukraine is minimal; interest in Israel/Gaza is hands-off. Iran – Quiet. Rumbles of Iran getting involved in Iraq continue. October 13, 2014 – ISIS continues in the headlines–as does Syria. Alternate Corporate Media is a gusher of pre-war propaganda. SPECULATION: Pieces continue to be moved into place for World War 3. As the war gets closer, “war fever” will continue to be built in the USA via the Corporate Media. Social media has also followed this trend with plenty of anti-Muslim tweets, FB posts, etc. SPECULATION: The next terror attack on US soil could see allegations of domestic terror groups involved. This would lead to increased crackdown on the civilian US population, including, one suspects, highway checkpoints. Next US terror attack may not be nuclear related as most are predicting. Ebola/bio attack or EMP seems most likely in our estimation. Overall Tension Assessment: Ukraine is bloody and steady. Lithuania, Estonia and Latvia appear ready to join Ukraine as pieces of the Soviet Reunion. Libya and Syria are both a mess. Iraq is a bona fide war zone. CONCLUSION: Again this week – The only thing holding back war is the time table. It appears it is not quite right yet. There is still more fear to promote and other themes which need a bit more time to develop.